Welcome to Battlestar Galactica – Starship Battles, the new miniature board game created by Ares Games, launching at the end of 2018. 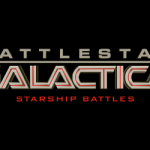 In Battlestar Galactica – Starship Battles, players take control of Colonial and Cylon spaceships and face each other in furious dogfights and daring missions, piloting beautiful pre-assembled and pre-painted miniatures, faithfully representing the spaceships from both the Re-imagined and Classic versions of the shows. The entry point to the game will be the Starter Set (estimated release date December 2018). The Starter Set is a complete game, but it is also the entry point for the whole range of Battlestar Galactica – Starship Battles products. 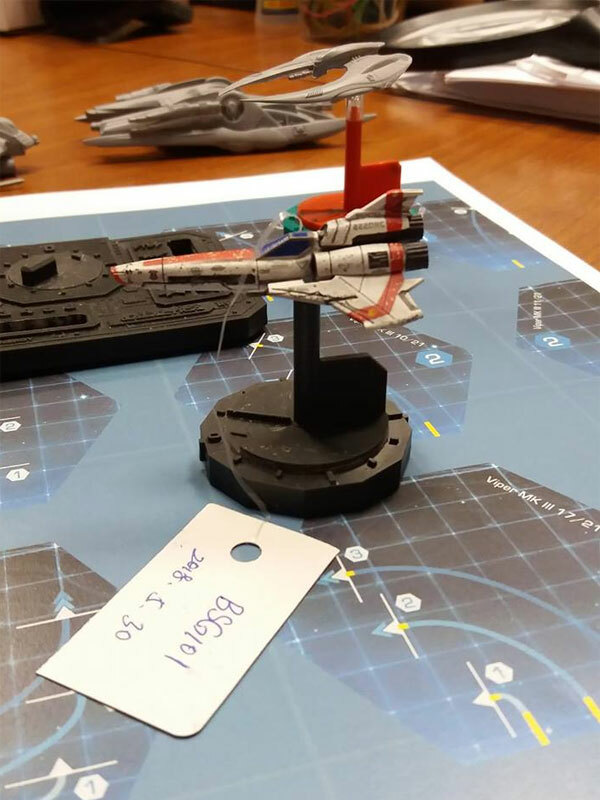 Pre-production sample of a Colonial Viper Mk.II model, and a glimpse of a few more of the first spaceships in the background. The Starter Set includes four miniatures: two Colonial Mk. II Vipers (including Apollo’s Viper and his pilot cards), two Cylon Raiders, and everything you need to play them. The Starter Set allows two to four players to play different scenarios, from heated dogfights to dangerous missions, with each player controlling one or two spaceships. The game system is surprisingly easy to learn, and at the same time features all you expect to find, if you are a fan of the show: your spaceships will be maneuvering and fighting in the same way you have seen on screen. 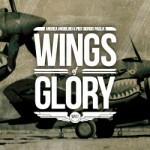 You can begin playing in a few minutes with the Quick Start Rules: this introductory section of the booklet jump-starts you into the action, explaining how to handle a simple dogfight, where the goal is eliminating your opponents. Quick-start rules offer you immediate action with no headaches. Each spaceship has a unique deck of maneuver cards (hexagonal-shaped, of course!) and each maneuver card features different “movement arrows.” Plan your speed on the control panel, choose your card, allow for the G-value (“difficulty”) of the cards you pick, and you are ready to fight! Different spaceships have different decks, to take into account their different speed and maneuverability. Once you’ve learned the basics of flying and fighting with a spaceship, you can read the Complete Rules and play a broad range of different scenarios. Are you ready to rotate your Viper and shoot your opponents to the right and left, while your fighter speeds ahead due to inertial movement? Are you ready to drift in space, handle your thrusters to take kinetic energy into account, and feel the vibe of piloting a “real” spaceship in a dogfight? This is possible with the complete rules. 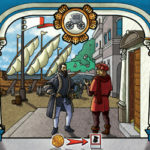 It’s not as complicated at all - as you will find out reading our next articles – thanks to the help of unique game components: the maneuver deck, the control panel, and the drift ruler. 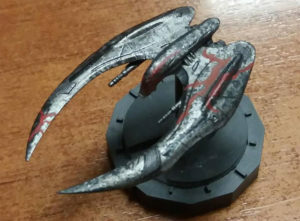 Pre-production sample of Scar's Cylon Raider. 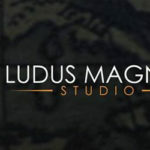 You can also add further details to the game by including some or all the optional rules, which make combat more detailed by simulating situations such as tailing, aiming, critical rolls, and more. Last, a scenario may use some of the Optional Features. They add special elements to the game, from pilots’ abilities to the use of asteroid fields and planetoids, to Faster-Than-Light jumps. Of course, you can always choose to include these features in any of the “normal” scenarios to spice them up! The Starter Set includes four models, but there is no limit to the number of spaceships you can play with, or to the number of players who can take part in the game. You can add more spaceships to your games with additional Starter Sets or Spaceship Packs. 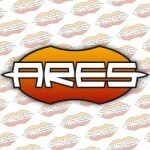 Our initial release will include the Viper Mk. II and Cylon Raider packs - to expand the core of the Colonial and Cylon forces - but they will soon be followed by new additional packs, featuring Raptors, Heavy Raiders, Viper Mk. VIIs, and more. 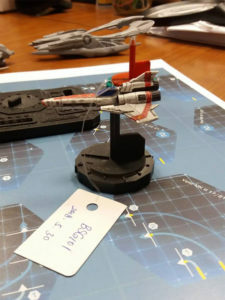 Each spaceship will release in a “standard” version, and in special variants including the markings of specific pilots and his or her pilot and skill cards. 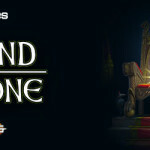 Look out for Scar’s Raider, Starbuck’s Viper, Boomer’s Raptor, and more! Our game system will also stretch out further during 2019 and beyond, to include atmospheric combat rules, missiles, and capital ships. For more information about Battlestar Galactica – Starship Battles, see the answers to the Frequent Asked Questions.